Will Old Transit Systems Eat Up All the New Starts Grants? One of MAP-21’s many mixed blessings was the New Starts Core Capacity program. It expanded eligibility for New Starts grants — normally reserved as capital assistance for new transit lines — to existing corridors. To qualify, the system just had to show that the improvements would expand the capacity of the line by at least 10 percent. The double-edged sword is this: The expanded mission didn’t come with any more money. In fact, the Federal Transit Administration saw its funding for New Starts/Small Starts frozen for several years, and then faced a 7 percent cut with the sequester for 2014. Luckily, the budget deal appears to have saved them from that, and though details are still forthcoming, it may mean a more modest 2 percent cut. Less horrific than was feared, perhaps, but still less money for more eligible projects. That’s led some people to fear that the smaller, newer systems New Starts has traditionally targeted could lose out to legacy systems in major transit markets like New York and Boston. Those concerns came out last week during a Highway and Transit Subcommittee hearing in Congress, focusing on the new program. The first New Starts Core Capacity grant to an existing line was put in the project pipeline last month — for Chicago’s red and purple lines, a $4 billion project. Chicago’s had good experiences with this kind of capacity expansion. CTA President Forest Claypool told the panel that high ridership had pushed the agency to make similar improvements on the brown line — improving stations and expanding the platforms to accommodate eight-car trains — and the ridership increase blew away expectations, meeting 2020 goals in 2011. Homes along the brown line increased in value by 40 percent. They’re looking to repeat that success on the red and purple lines, “the backbone of the system,” according to Claypool. 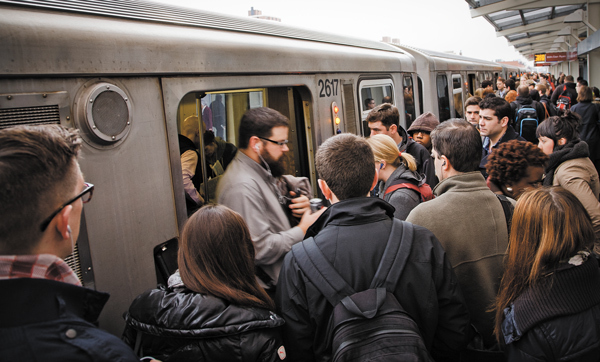 The 100-year-old red line is over capacity, already leaving passengers on the platform. The CTA plans to widen and extend the platforms, modernize the signal system, add electrical substations, straighten curves that force trains to slow down, add track at key bottlenecks, and make all stations ADA-compliant. Claypool says these improvements could double capacity on the corridor, adding 130,000 more rides each weekday. As he told the panel, “That would compare very favorably with any New Start project around the country.” If the idea of the program is the build transit ridership, Chicago’s red/purple line project is a winner. And that’s exactly the kind of talk that gets under the skin of people served by smaller transit systems. Rep. Roger Williams, a former car dealer who represents a district north of Austin, asked if Texas transit providers should be concerned that the FTA would focus on larger projects at the expense of smaller ones. “We’re new at this,” he said. FTA Administrator Peter Rogoff countered that there were actually a lot of vibrant transit projects going on in Texas, from El Paso’s bus rapid transit to Dallas’ light rail system. He said Texas transit authorities — and other, smaller providers around the country — shouldn’t worry about getting “choked out” by the big players. California Democrat Grace Napolitano suggested that upgrades to existing lines should use funds slated for state of good repair, not New Starts, but Chicago’s Forest Claypool countered that New Starts was intended to build ridership, and that’s just what his project does. Claypool noted that cities including Dallas, Washington, and Charlotte are pursuing New Starts money for existing lines, too. But to date, the only other city to submit a Core Capacity grant request under the new eligibility was New York City. Rogoff said New York’s application was withdrawn when the city was overwhelmed with the recovery from Hurricane Sandy, but he expects it to be resubmitted soon. The project would increase ridership capacity by 13 percent on the E line between Queens and the World Trade Center, a line that currently serves 375,000 people a day. The 50,000 extra daily riders the line could sustain after such a project would beat out just about any other New Starts project in the country. Rogoff says FTA is “agnostic” on whether project applications are New Starts or Core Capacity. When Napolitano asked how FTA would fairly distribute funds if the program is over-subscribed, he answered that the agency “wouldn’t be in this predicament” if Congress would just pass the Obama administration’s budget request. With the additional $400 million in that budget proposal, the New Starts/Small Starts program would be able to take on a lot more projects. Rogoff clearly resents being put in this situation, especially after the FTA “heeded Congress’s call to streamline New Starts and improve its efficiency,” with 90 percent of its current projects slated to come in on time and on budget. New systems and small, urban and rural, Rogoff said — they all share the same concern: the upcoming “transportation fiscal cliff” that will hit at the end of this fiscal year if Congress doesn’t find a way to get more resources — a lot more resources — to the Highway Trust Fund. Still, conceptually, an old system is a better place to make moderate investments because it has the most potential to attract more ridership. Every n stops on a transit system means n-1 origin-destination pairs, so riders on a new line intersecting with an old system get the benefit of a much bigger (n-1) than a new line in a place without other service. Bottom line from this: we drastically underfund transportation in this country. Funding Transit is SO FRUSTRATING! I’m glad that other areas see the benefit in transit and want “their fair share”, but when there is a limited pool of money it does make sense to see where the money will have the greatest impact. Of course this is a bit of a chicken and egg problem. You need to demonstrate benefits before you can get more local match, but typically the greatest potential and largest impact is where you have an existing system. But like “Froggie” said, if everyone wants money we need to raise the funds! BUT we also cant go crazy building new transit systems with no way to fund operations and maintenance. ALSO these projects need to make sense! These projects have to be planned carefully and attractive to potential users. Me, I’d go for the new-riders per dollar method of disbursing the funds. Now maybe stigmatized rural and sub-urban projects can deliver but I am hard pressed to believe it. But then will10% of Chicago’s busiest line really deliver the best new-riders per dollar value? I don’t know. For me the point is getting people out of cars. It always helps, both for walkable cities and the planetary atmospheric climate. As far as Tom Petri (R-WI) thoughts, well he’s a “concern troll” in my book. If he was really concerned about big cities eating all his transit dollars he would get his Republican friends to better fund transit. If you want to “get people out of their cars”, then new service/link riders per dollar is not a good metric, since they can be transferring from worse public transportation options (bus-to-rail), they can be people doing new trips that didn’t happen before (on any mode) etc. Dollars-per-rider is also problematic that it skews funding toward high-volume short-distance trip systems. Any core-area subway or heavy rail project that comprise some connecting line linking other services in New York, Los Angeles, Chicago and the like will deliver a lot of riders per dollar. Are 100 riders taking 1 mile trips when 9 of them are speeding up their transit journeys more worth the money than 10 riders ditching their cars for a 10 miles trip? Now you could also create a metric on “choice car riders attracted”, the best way to do that is to put cheap/free park-and-ride facilities on commuter lines. It depends on the horizon you look upon. 25 years ago, Denver and Salt Lake City were fairly low ranked among cities where transit experts would look upon as places where transit is making an impact. Now, you have both cities with fairly new systems doing reasonably well on otherwise rather auto-centric recent-growth metros with much further potential for TOD and the likes. Neither was a place with some “strong longstanding transit base” to build upon, both are now taking advantage of their growing networks. If all money had went to build transit extensions in New York and Chicago, we’d still have two Western metros that would be just places where nothing significant would be going there in terms of alternative transportation to cars. We have the opposite problem, if anything. Transit financing in New York and Chicago is largely diluted (if not quite ignored) because we have to spread the wealth across the country. I don’t think there should be no new investments (actually, I think there should be many, many more), but if we’re just talking about partitioning the small pie of transit dollars we have, the outcomes will be better by giving the money to New York and Chicago’s systems. Thanks for replying. Shortly after posting I began second guessing my comment. I am out of my depth on this topic so I appreciate the education. How about a new-rider-miles per dollar? Yet this kind of spending is probably not the sort that might come from the kinds of funds offered here. Here’s the Auckland link. I would appreciate your insights.